The moon passed between the Earth and the sun on Thursday, Oct. 23. While avid stargazers in North America looked up to watch the spectacle, the best vantage point was several hundred miles above the North Pole. 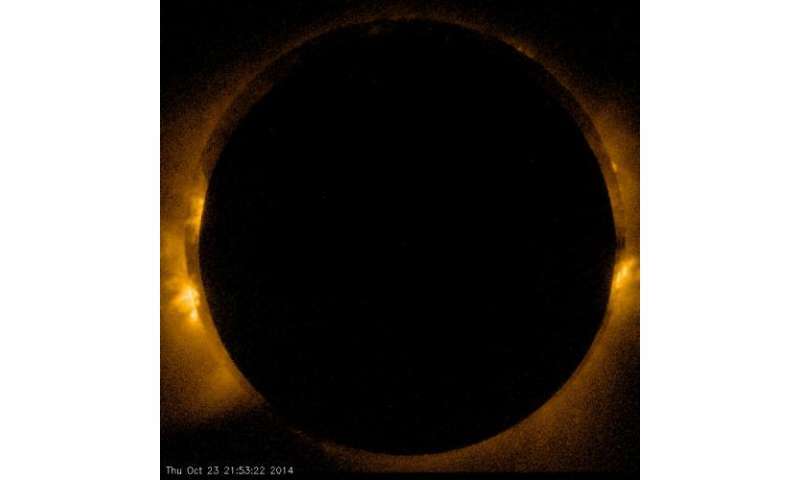 The Hinode spacecraft was in the right place at the right time to catch the solar eclipse. What's more, because of its vantage point Hinode witnessed a "ring of fire" or annular eclipse. An annular eclipse occurs when the moon passes directly in front of the sun but doesn't cover it completely because the moon appears too small. (The apparent size of the moon depends on its distance from Earth or, in this case, the spacecraft.) About one-third of all solar eclipses are annular. "This is only the second annular eclipse Hinode has witnessed since it launched in 2006," says astrophysicist Patrick McCauley of the Harvard-Smithsonian Center for Astrophysics. 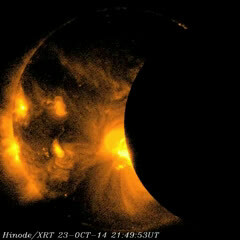 A movie of the eclipse as observed by Hinode's X-ray Telescope (XRT) is online. The XRT was developed and built by the Smithsonian Astrophysical Observatory and the Japan Aerospace Exploration Agency. Hinode's X-ray Telescope is the highest resolution solar X-ray telescope ever flown. The XRT collects X-rays emitted from the sun's corona - the hot, tenuous outer layer that extends from the sun's visible surface into the inner solar system. Gas in the solar corona reaches temperatures of millions of degrees. The energy source that heats the corona is a puzzle. The sun's surface is only 10,000 degrees Fahrenheit, while the corona is more than 100 times hotter. "We are very interested in studying solar flares," adds McCauley. "Flares are most dramatic in X-rays and we're using the X-ray Telescope to better understand the physical mechanisms that drive flares so that they might someday be forecasted." At the risk of repeating myself, I think its amazing how close the moon matches up with the apparent size of the sun. The moon is within 1.2% of a perfect match.